Few things bring me greater culinary recreational pleasure (yes, that’s a thing) than vintage cookbooks. I love hunting for them in antique stores, thrift shops, and yard sales, and then curling up to time travel through generations of menus. Regional and community cookbooks are my favorite (bonus points if they’re from New England), because I love the complex melting pot of American home cooking, but any vintage cookbook with colorful recipes, interesting anecdotal intros, and charming artwork is enough to turn my head — room on the bookshelf be damned. Last week I decided to pick one of my vintage cookbooks at random and make one of the recipes inside — no pressure, no expectations, just following the recipe and sharing the results, which is very different from my day job, where I have to test a recipe over and over until it’s just right. The lucky source material for this new assignment? A 1959 Crisco promotional cookbook titled “Praise for the Cook.” The illustrations inside the small, paperback, spiral-bound volume are perfection. 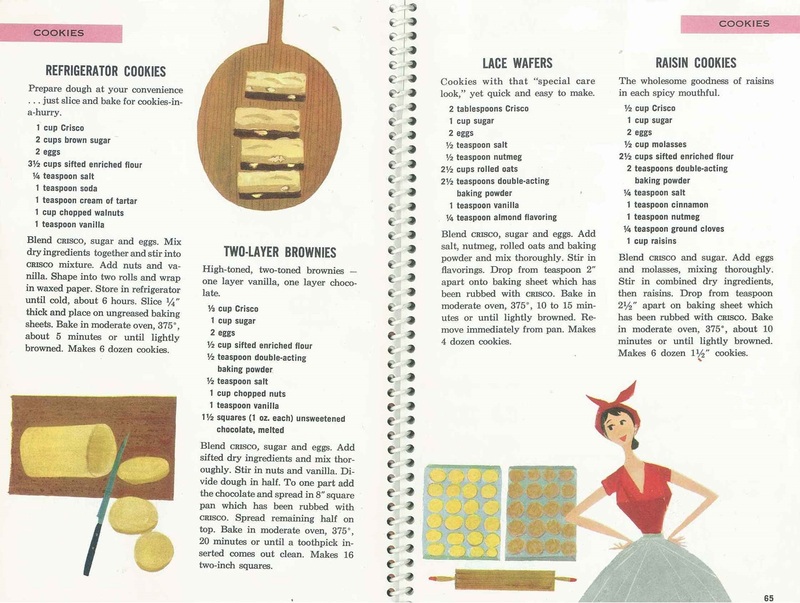 Vivid, whimsical, and deliciously 1950s. Wanting to make something simple that I could bring to a family party over the weekend, I settled on a recipe for two-layer brownies. Everyone likes brownies, and I wanted to see if the real deal looked like their illustrated counterpart. I didn’t have any squares of unsweetened chocolate (just what seemed like one hundred squares of bittersweet), so I looked up a cocoa powder substitute (see note in recipe). I also lined my pan with non-stick foil rather than greasing it with Crisco, but otherwise followed the recipe verbatim. Like a lot of older recipes, I immediately noticed how “little” batter it actually yielded. We’re so used to making an enormous 9×13-inch pan of brownies in today’s kitchens that the amount of batter required for an 8-inch pan seemed positively scant, especially since I needed to split it in half to make one chocolate. It was a little tricky spreading the chunky vanilla batter (there’s a lot of nuts in these, folks) on top of the chocolate, but I thought I did alright. 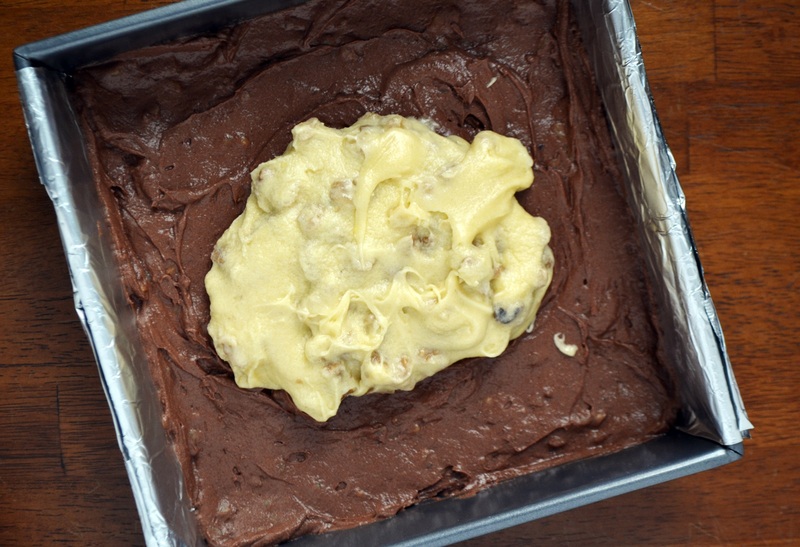 Two-layer brownie batter, ready for spreading. 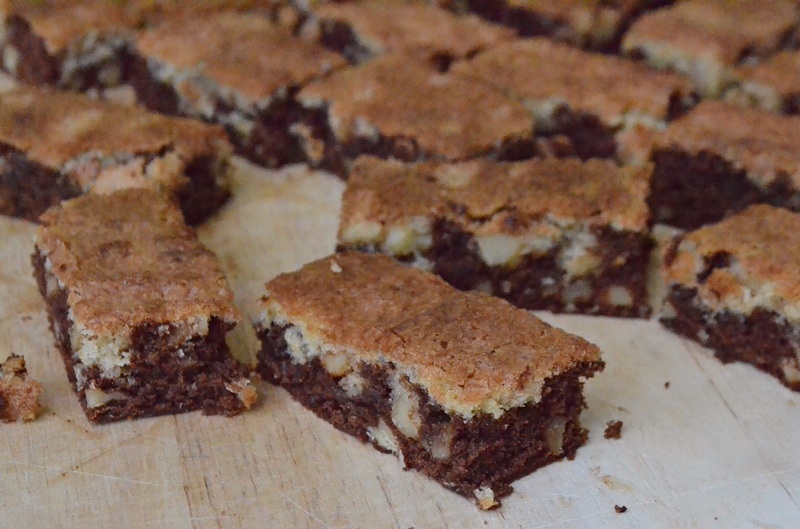 There weren’t really two layers in the two-layer brownies — at least not my batch. But were they still tasty? Absolutely. This was a fun little baking adventure, and since (like most people) I have more cookbooks than I will ever need, it might be fun to do more of this in the future. It’s time to make those dusty old gems earn their keep! 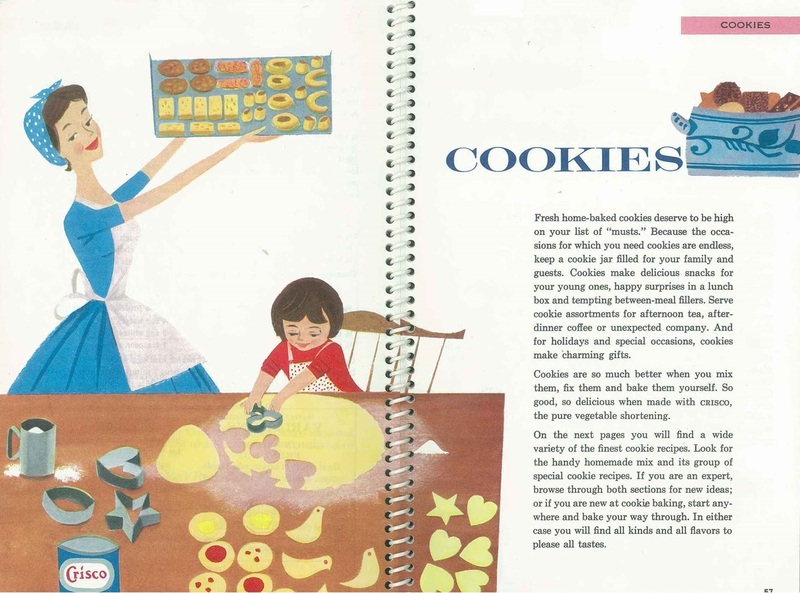 Are you a fan of vintage cookbooks, too? 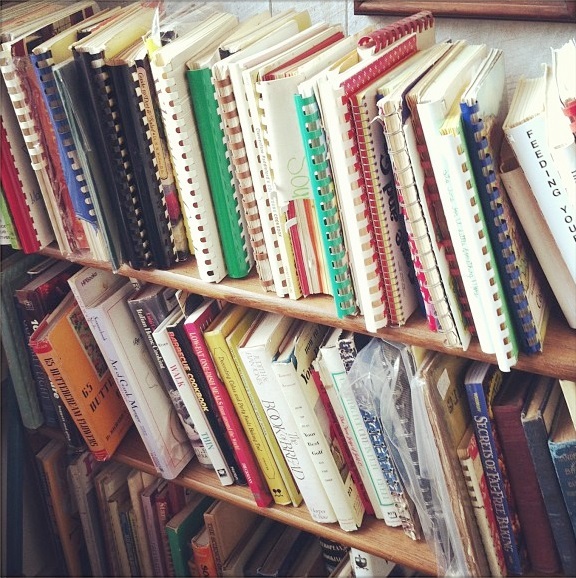 Do you have a cookbook hoarding “problem” like I do? If you answered “yes” to either of those — high five, my friend. Note: If you don’t have any squares of unsweetened chocolate handy, you can substitute 3 level tablespoons unsweetened cocoa powder and 1 tablespoon butter or shortening for every 1-ounce of unsweetened chocolate. Preheat the oven to 375 degrees and grease an 8-inch square pan (or line with parchment or non-stick foil). In a small bowl, whisk together the flour, baking powder, and salt. In another bowl, beat together the Crisco (or butter) and sugar until light and fluffy. Add the eggs one at a time and beat until smooth. Add the vanilla, and then stir in the nuts. Transfer half of the batter to another bowl and add the melted chocolate. Stir until thoroughly combined. Spread the chocolate batter evenly into the pan, then top with the remaining batter. Use the back of a spoon or an offset spatula to gently spread to cover. Bake for 20 minutes or until a toothpick inserted into the center comes out clean. Allow to cool for at least 15 minutes, then cut into rectangles (or squares) and serve. 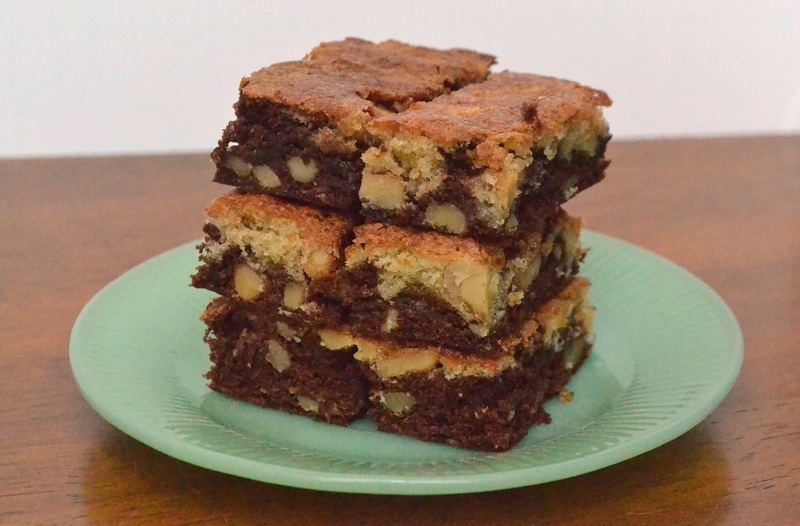 Click to view and print the recipe for Two-Layer Brownies .